We’ve had our power back for over a week now – we’ve had it back as long as we’d lost it. But I still have dreams every night that we don’t have power, and I wake up in a panic. I’m embarrassed that it affected me so strongly, but I’m not alone in my residual stressedness. I’ve talked to many people around town who say that they, too, are having trouble recovering from the incident. They say it feels like getting over the flu – they feel physically tired and draggy and unwell. It’s stress! So strange and powerful a force. The other day on the radio we heard a news story about people driven out of their home by war – worried about keeping their families warm and fed through the coming winter. A small part of me thought, “I know what that feels like!” And then the rest of me thought – “no you do not! Don’t be absurd! You have no idea!” We were anxious and uncomfortable, but we were never really in danger, once the storm had passed. We had a fully stocked grocery store 15 minutes away. We have a house, with walls that keep out the worst of the cold, even when the heat isn’t on, and with doors that lock. We have relatives an hour away who got power back before we did. This is something I think about quite frequently – even before the storm hit. I think about people who don’t have my comfortable life. Who don’t have the luxuries that I’ve come to consider necessities – hot water, electricity, my choice of pretty much any food I can think of. I think about refugees and fugitives – people driven out of their homes by war or occupation. In my own life, I’ve come to realize that it’s the small, every-day things that ultimately make me happy or anxious or disgruntled. I wonder if it’s the same for people who are completely unsettled and unstable. I found myself so undone by … what? anxiety? Discomfort? … that I couldn’t concentrate on much of anything, large or small. I’d been so anxious about the election – so worried that Obama wouldn’t win, but on election night I couldn’t concentrate on the results coming in, and I couldn’t let myself feel as happy and relieved as I should have that he won. I could only feel anxious about when we’d get our power back. I couldn’t think clearly about the bigger political picture. It made me wonder about times and places when the bigger political situation causes stressful personal circumstances. Can you find enough strength and hope to change the situation when you’re brought down by anxiety about your next meal, or when you don’t have a safe, warm home, and winter is coming? I like wild rice, but I don’t cook it very often, because I’m so comfortable cooking basmati, that it’s a worry-free situation for me. Quick, tasty and dependable. This dish combines wild rice with basmati and french lentils. It’s very autumnal, especially with the addition of roasted butternut squash and mushrooms, and the flavorings of sage and rosemary. I thought this was really tasty – savory, a bit sweet, a bit smoky with the cheese. Comforting! I made a purée of cauliflower and carrots to go with this, and flavored it with sweet smoky spices like cardamom and ginger. Sweet and soft where the rice is earthy and full of texture. A nice combination! Here’s Police on My Back by The Clash. It might sound silly, but this is one of those songs that gets me to thinking about how you find hope and happiness when your life is dangerously uncertain. Preheat the oven to 425. Toss the mushrooms and the squash with olive oil, and spread in a single layer on two baking sheets (bake them separately). Roast until browned and crispy on the outside. Twenty minutes for the mushrooms, a little longer for the squash. Meanwhile, warm the olive oil in a medium-sized pot over medium heat. Add the shallot and bay leaves. Cook for about a minute until the shallot starts to brown. Add the garlic rosemary and sage, and cook for about a minute more, until the garlic starts to brown. Add the wild rice. Stir to coat, and cook for a minute or two, then add 4 cups of water. Bring to a boil, reduce heat, and simmer for twenty minutes. After twenty minutes, add the french lentils. Stir them in, and then cover and simmer for another five minutes. Add the basmati rice, stir it in, and then cover and simmer for about 15 more minutes. Taste to make sure the rices and the lentils are cooked. Everything should be soft but still have a bit of texture, you don’t want it too mushy. Most or all of the water should be absorbed. If not, remove the lid of the pan and cook for a minute uncovered. Take off the heat, stir in the butter, tamari and balsamic. Season well with salt and pepper. Pile the rice mixture on a big plate, and gently mix in the roasted vegetables, top with smoked gouda and pecans. Put the carrots and cauliflower in a medium-sized pot, and add enough water to cover by about an inch. Bring to a boil, and boil for 5 or 10 minutes, until the vegetables are soft but bright. Drain, and combine in a food processor with all of the other ingredients. Process until smooth. 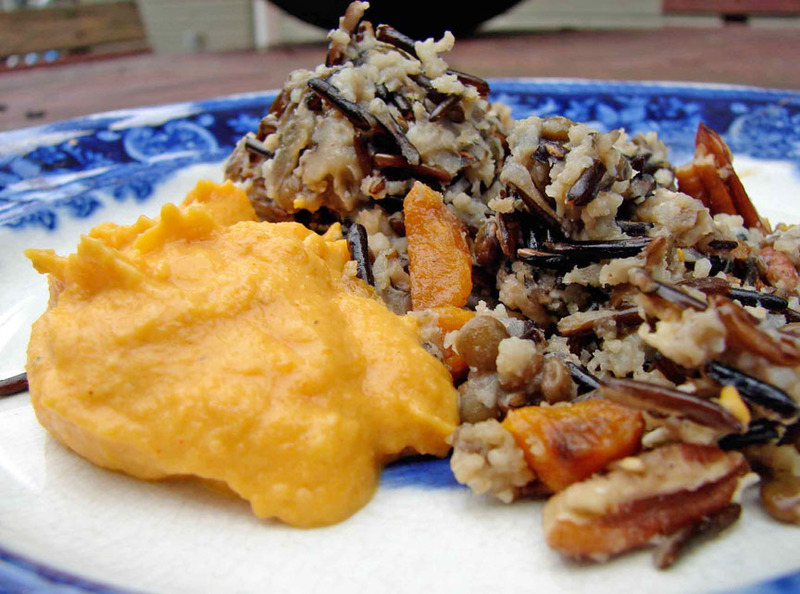 Serve with the wild rice. This entry was posted in lentil, recipe, rice, sauce, Uncategorized and tagged french lentil pilaf, rice pilaf, vegetable puree by Claire. Bookmark the permalink. I wish you the happiest of dreams! And where is Isaac’s birthday cake? Thanks, TFD. You’re so kind. I can’t imagine being homeless with children – how long did you live that way? And I spent the afternoon making pictures of Isaac’s cake! He had his “friend birthday” this evening, and it was loud, fun, and exhausting – well, David and I are tuckered out, but the boys are chattering away in their beds! I’m off to mine. We didn’t find ourselves on the streets, because three of us were children. But social services threatened me with the hostel for the homeless and when I refused rehoused us on a very grim ‘sink’ estate; I wasn’t downhearted though because it was in the same area so the kids could stay at their same schools. And because I knew we wouldn’t be there for long. I knew that cake would be *great*! I’m glad it wasn’t for long, but it sounds like a tough time! Good morning, from not very warm or sunny Devon. I’m new to your blog, a grandma to kids the same age as yours, and mad about cooking and providing for family (still!) and others. Being a mum anxious to feed family whatever the circumstances never goes away, even when your kids have left home! It’s what mum’s do. I love your writing, your comments are enlightening and insightful, and fun to read. The sound of your wild rice recipe above makes my mouth water! I’m definitely giving it a go. ‘Him indoors’ will just have to chew the wild rice extra hard (he’s not a fan), but the flavour combinations sound lovely. Just right on this dull English day! Toodle pip for now! There does seem to be some deep instinct about feeding kids and keeping them warm that defies all logic!